After the death of his parents, Theophanes and his wife visited monasteries in the Sygrian district (Asia Minor), Theophanes met the Elder Gregory Stratitios, who predicted to Theophanes' wife that her husband would earn the crown of martyrdom. Later, St Theophanes founded another monastery in Sygria, at a place called the "Big Settlement", and became its igumen. He participated in all the work of the monastery, and was an example to all in his love for work and ascetical effort. He received from the Lord the gift of wonderworking, healing the sick, and casting out demons. The Seventh Ecumenical Council met in Nicea in 787, which condemned the heresy of Iconoclasm. St Theophanes was also invited to the Council. He arrived dressed in his tattered garments, but he revealed his wisdom in affirming the veneration of the holy icons. At the age of fifty, St Theophanes fell grievously ill and he suffered terribly until the day he died. Even on his deathbed, the saint continued to work. He wrote his CHRONOGRAPHIA, a history of the Christian Church covering the years 285-813. This work has remained an invaluable source for the history of the Church. During the reign of the emperor Leo the Armenian (813-820), when the saint was advanced in age, the Iconoclast heresy returned. They demanded that St Theophanes accept the heresy, but he firmly refused and was locked up in prison. His "Big Settlement" monastery was put to the torch. The holy confessor died in 818 after twenty-three days in prison. After the death of the impious emperor Leo the Armenian, the "Big Settlement" monastery was restored and the relics of the holy confessor were transferred there. 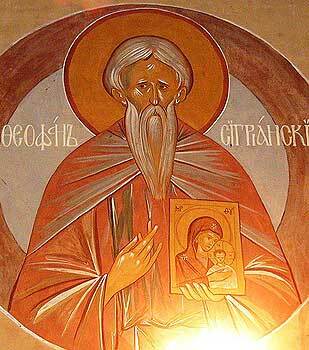 O our holy Father Theophan, pray to Christ our God to save our souls.